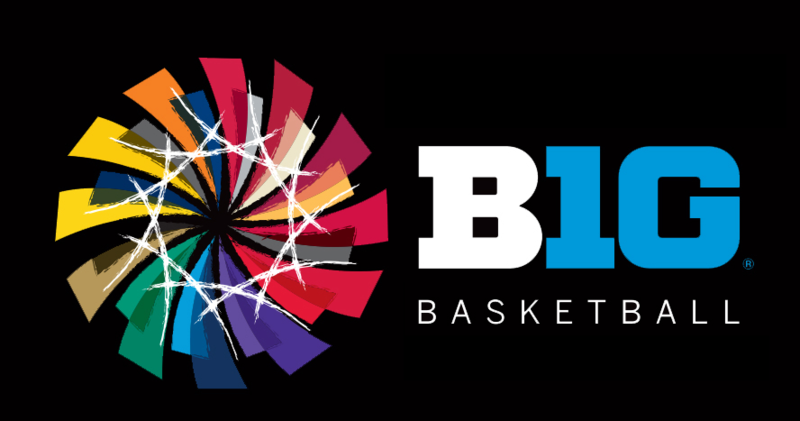 With another college basketball season upon us, I thought I would fulfill a long standing promise to produce a well thought out, and insanely predictive Big Ten Preview for this fine sports medium that is CrossRoads Sports. 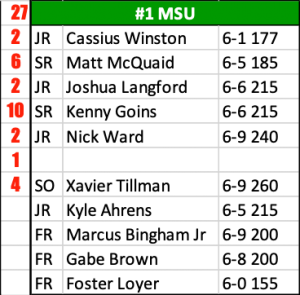 For the past several seasons I have maintained a spreadsheet consisting of each school’s roster, a conference ranking by position, as well as a system to statistically compare each team’s overall standing. 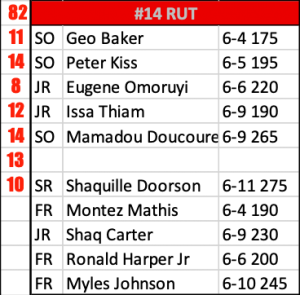 I will share the process in which I try to objectively evaluate each school’s roster and how the system works before I dive into a little bit of analysis on each team. Right or wrong, at least there is some statistic validity to the process. 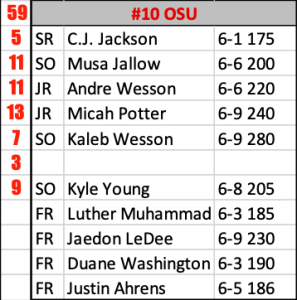 First, several credible sources were referenced to create a team’s top 10 players, divided among their position on the team. Positions PG, SG, SF, PF, C indicate the team’s projected starting 5. 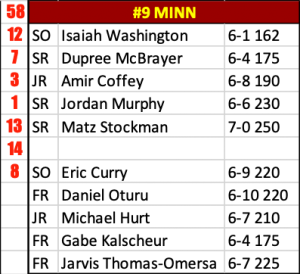 Positions 6-10 are the top bench players, sorted in order of anticipated minutes played. 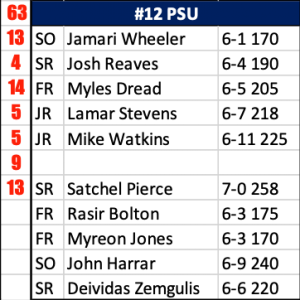 Once all 14 rosters are established, it is time to rank each position across the conference. 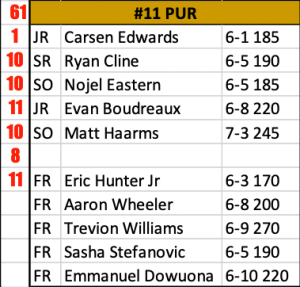 Each of the starting 5 positions is ranked from 1-14 (example: Purdue gets a 1 in PG position ranking since Carsen Edwards is projected to be the #1 player in the conference at that position). All 5 positions are ranked in this method. 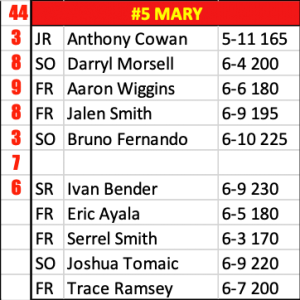 Next, two additional components of the teams are ranked: their coach, and their bench (all 5 additional players on the roster as a group). 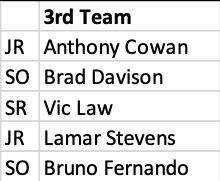 Finally, add the ranking that each team gets on all 7 positions (PG, SG, SF, PF, C, Coach, and Bench), and the combined total becomes that team’s Overall Rating. The lower the score, the better that team should be. 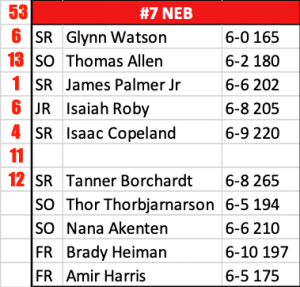 These ratings can then be translated into a full projected standings for the conference, as well as a pre-cursor to some of the annual awards that are given out in March. So, without further ado, I will get into the meat of the much anticipated First Annual CrossRoads Sports Big Ten Preview. 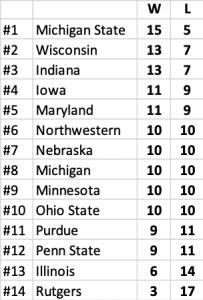 Below are my projected Standings for the upcoming season. More so that I can remember in recent seasons, there was a large grouping of teams in the middle. What the numbers have told me is that we should see a top 3 emerge slightly ahead of the middle of the pack, a bottom 2 that are clearly worse than the rest, and a massive grouping of 9 teams in the middle that will make this conference the typical day-in day-out slug fest that the Big Ten reputation permeates. Essentially anyone can beat anyone else any given night. Coupled with the fact that there are now 20 conference games on each teams slate likely doesn’t bode well for the national perception of the conference, unfortunately. Now that every Purdue fan from here to Tippecanoe has cursed my name and thrown multiple objects at their screens, allow me to share a quick snapshot of each teams’ ratings so that you can see where some of the data fell out. Argue with some of my rankings if you want, but I try to take a very objective approach. In Purdue’s case this year, I’m sorry but I just don’t see much outside of your stud PG. Enjoy. My prediction to win the conference title is the Michigan State Spartans. Driven by their stellar junior class of Winston, Langford, and Ward and senior role players McQuaid and Goins, the conference’s best coach will have one more conference title to add to his collection. Another successful Badger season seems upon us this winter. 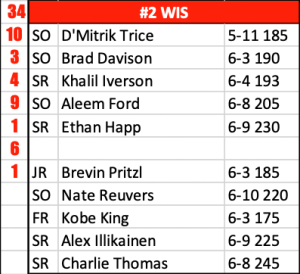 A stable of consistent talent who buys into the system led by a senior National Player of the Year candidate in Happ, it’s easy to see why Wisconsin projects to continue to make the Kohl center a nightmare for the opposition. The Hoosiers should bolster the best inside-outside one-two punch in Langford (go ahead and pen him in for conference Freshman of the Year, if not National Freshman of the year – the real deal, Holyfield) and Morgan. Depth will also be a big asset for this team as we get into conference play. I’ll be honest, this was the surprise team to me when I went to total all the rankings. They just won’t have a weak spot anywhere on their roster, have good coaching, and it is time for Cook and Bohanon to take charge of this team and drive them forward. 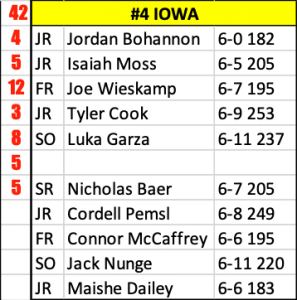 Watch out for the Hawkeyes. Another team with balance and no discernable weak spot, Maryland will welcome some highly-touted newcomers to take over for the wealth of talent they lost from last year. Cowan and Fernando provide experience and talent at their positions. The Terps will remain relevant. Another surprise as I was tallying the results, Northwestern welcomes two incoming transfers in Taylor and Turner who look to combine with the Cat’s standouts from a year ago, Law and Pardon. Despite being a veteran team, the hole McIntosh leaves behind at PG could prove costly. A trio of seniors will need to lead this Cornhuskers team to be effective. Palmer on the wing looks to build on an excellent season last year, while Watson at the point and Copeland in the post will provide veteran experience. Will 6-10 197 frosh Heiman be able to compete in a physical Big Ten? With the top half of the conference spoken for, now begins the portion of the program in which the fan bases want to yell at me. Go ahead, yell away, but the numbers are what they are. Sorry, but your teams just don’t have as much talent as the ones we’ve already listed. So, better hope your coach can earn his stripes and become the Holtmann from a year ago (since we know he’s going to be down there, maybe he can do it again this year, but my money is on no – even though I think he’s a great coach). Initially, I was surprised to see the Wolverines this low. But when you look at how much talent is gone it make sense. 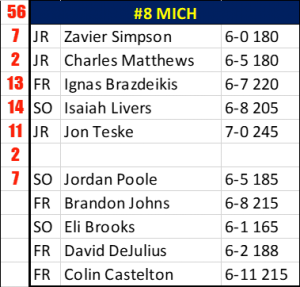 Matthews and Simpson will lead the way, but the front line deficiencies will catch up with Michigan. Bielein can coach ‘em up, but I think a lack of overall talent is the story. Murphy is the real deal, and will be in the conversation for Conference POY. Coffey and McBrayer provide a couple of additional weapons, but outside of that there simply isn’t that much talent. A big time disappointment a year ago, the Gophers appear headed for mediocrity at best. While I think Holtmann is one of the best coaches in the conference, sometimes even coaching can’t overcome a lack of talent. Jackson and K Wesson are fine players, but after there’s just not much. Outside of someone unheralded stepping up big time, it may be a long year in Columbus. Edwards might wind up wishing he had gone pro in the off season. The talent he would be playing with in that league versus his Boilermaker teammates this year? Um yeah, slightly different. If these ratings are predictive, could this be Painter’s final year in West Lafayette? A 3rd team All Conference candidate in Stevens, defensive POY candidate in Reaves, and a solid big man in Watkins form the foundation of what could be one of the better defensive teams in the conference. Unfortunately, lack of depth will likely cap the teams potential. 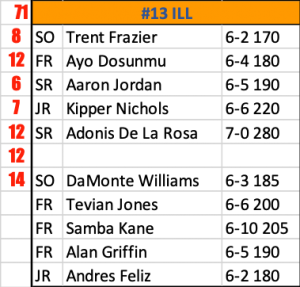 While the Illini should be favored when they play Rutgers, it is hard to imagine them being favored in many other conference games this season. Frazier, Jordan, and Nichols will be the leaders of this team, but Underwood will have his work cut out for him in Champaign this year. Death, taxes, and the Scarlet Knights finishing last in the Big Ten. I’m not sure what else to say than that, honestly. Baker showed flashes a year ago, and a thin SF position across the conference could mean that Omoruyi could have some opportunity to shine. Good Luck. If you made it this far, then you are a true Big Ten hoops fan and I applaud you. Looking forward to another great year of college hoops, and will be interested to see how my first officially recorded predictions actually do. One thing is for sure, they will not be exactly correct. But close counts in horseshoes, hand grenades, and Big Ten Annual Predictions.